We take it you are driving off into the sunset for a car camping adventure after a long, stressful week at work? That lightweight backpacking tent you have wedged into your trunk? The one with complicated poles that takes 20 minutes (on a good day) to set up? That doesn't seem too relaxing! Instead, you should invest in a car camping tent, which is made to be roomier, can be set up in mere minutes and will truly elevate your camping experience. Read on to discover the best car camping tents and the key features you need to look for! The weather capacity and rating of your tents will always be the most important feature of the tent you're taking with you for car camping. Why? Because it could mean the difference between life and death! (of your happiness that is-- you are car camping, so you're definitely only a stone's throw away from your car). Summer tents will be outfitted with plenty of airy ventilation that'll catch all those summer breezes. While a three season tent will be equipped with versatile flaps and zippers that you can open or close, so you can customize that insulation level of your tent. Reversely, a bonafide four season tent will come with all the bells and whistles you could want to keep yourself warm on a frigid December night and properly cool during a hot summer day. Obviously, you should select a tent that adequately prepares you for harsh elements, whether that be sleet or sun that is characteristic to your go-to car camping spot. Also, always remember that it is always better to be over prepared than under equipped. When you're bringing the car, you don't have to worry as much about saving space or weight, so you don't have to make the same sacrifices as if you were hiking the Appalachian trail, for example. Tents that fall into this category tend to house 4-12 people. But despite what the tag claims, a tent never holds it purported amount. This is due to the fact that camping tent companies often don't factor in space for gear, sleeping materials, or honestly just a little elbow room in their estimates. A rule of thumb traded among seasoned adventurers, is that you should always underestimate the holding capacity by a few bodies (e.g. a 4 person tent comfortably holds 3, and a 10 person tent holds 8). Additionally, if some adventurers in your troop are tall, you need to find a tent that is long enough to accommodate their height or else your poor tall friends will end up curled in the fetal position all night. So when you are shopping around, keep in mind what you want to sleep with in your tent (whether that is your backpack or your extra tall friend). 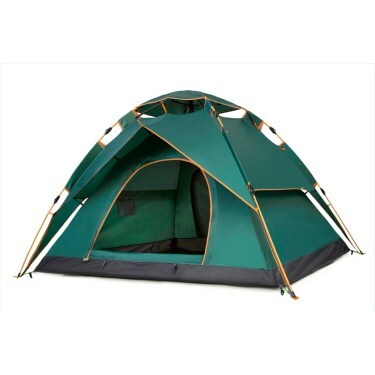 Two tent doors will also allow you to exit the tent without clambering over your tent mate. Finally, campers tend to spend a significant amount of time inside of these tents and unlike backpacking tents, it isn't just a place to konk out. So you're going to want a tent with plenty of space for you and company to sprawl out. 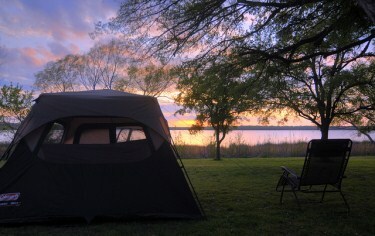 Another tell tale characteristic of the right tent to take camping when you're driving is superb ease of use. Easy up cabin tents with pre-attached poles are some of the most popular since you can just extend the pole structure, click it all into place and crawl on into your new canvas home. These large tents are engineered to be stress free and easy to throw up and tear down so you can spend more time sipping on coffee and reading in the sun rather than spending a solid half hour trying to push those finicky tent poles through impossible fabric loops. Nylon and polyester tents are waterproof but often degrade quickly via sun damage. Cotton (canvas) is another material that can be waterproofed but if it does end up absorbing water, it becomes quite heavy and difficult to dry out. With all tents you must make sure that the seams are sealed (because even a raincoat would leak if the seams aren't totally welded shut). Additionally, your tent's fly should be made with waterproofed nylon with polyurethane and silicone coatings to truly repel water. Additionally, the best rain flys will cover all of your tent including windows and doors to provide maximum protection when that surprise rainstorm inevitably arrives. Since you won't be hauling this tent on your back, the weight of it won't be a huge deal breaker during your selection process. But since you will be loading this tent into your car routinely, make sure to select a tent with a good carry case so it is easy to lug around and even easier to pull out of your trunk. Lastly, condensation in your tent will put you on the fast track home. You will want tent ventilation that is available even with the rain fly on, since you still need vents for the hot air to escape even on a cold, rainy night. Take care to remember that the more campers that are wedged in your tent, the more you'll need ventilation, because even if you leave your damp gear outside, your breath is the biggest cause of condensation. Also, the best tents will have zippable ventilation flaps so you can accurately adjust the airflow to compensate for your whole tribe of tent mates, and keep those exterior temps, exterior. If you aren't experienced in setting up a campsite, Justin Yapp plays out the process in 5 easy steps. First of all, no matter what kind of tent you are setting up, you will require stakes, and a mallet. You might want to bring a metal rake for clearing the ground where you will lay your tent, but you can also just kicks rocks away with your feet. Second, you will lay out your tent, loop in the poles, or extend and click into place if they are pre-assembled. Third, clear out and rake the area so you aren't sleeping on some stray rocks or sharp twigs. Fourth, hammer in the stakes well so the tent doesn't slide around or fly into space when the wind picks up. Lastly, click or slide the poles into place and viola! You tent is good to go. 72.01 x 107.99 x 120"
120 x 120 x 84"
78 x 132 x 192"
108 x 84 x 68"
94.4 x 82.6 x 53"
150 x 96 x 66"
The Coleman Outdoor Instant Tent makes camping a cinch. Why? Because you can have the tent set up or collapsed and packed away in a literal minute. The rugged Polyguard 2 fabric, exclusive WeatherTec system, and an integrated, vented rainfly keep you safer from unexpected weather. This boasts an extremely spacious cabin that can fit two queen-sized airbeds, so you won’t have to have a 6 person spooning session. Two inner storage pockets provide a place to put your tools, gadgets and snacks. Lastly, adventurers from every corner of the camping world will dig the Illumiline reflective tie lines that add some major visibility, as well as the no fuss, pre-attached poles of this instant cabin. The Eureka Copper Canyon 6 Person Tent is a sturdy 3 season tent that’ll meet all your glamping needs. Its vertical walls increase interior space, while 7-foot standing space allows for plenty of headroom (rejoice tall adventurers!). Windows on each side increase visibility and ventilation, and the full mesh roof improves air circulation, reduces condensation, and allows for stargazing so you can comfortably gaze up at the night sky from your toasty sleeping bag. 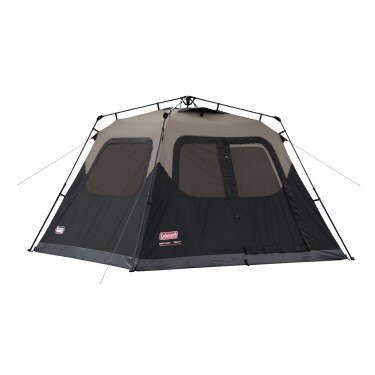 The 75D StormShield polyester fly includes a gear loft and multiple interior pockets for organizing camping nick knacks and snacks. Best of all this tent is equipped with an E! Power Port that lets you bring electrical power cords inside through a dedicated zippered port, so your speaker and phone doesn’t have to run out of juice, even if you are out in the boonies. The Wenzel 8 Person Klondike Tent is literally like a mini home and is in all honesty, bigger than some millennial's big city apartments. It has plenty of room to hold friends, family, your gear and more. And if that isn’t enough space, the huge screened-in porch doubles as an extra sleeping room when the windows are closed. Also, those big windows provide added air circulation. Specifically, the tent's rear wall has a lower zippered vent that allows for more airflow near the ground, which lends the tent some extra cooling power for camping trips on unbearably hot summer days. This Wenzel Klondike shelter has a patented "power corner" design, which makes it more stable when the wind starts to blow. It is also equipped with a gear loft for storing and organizing your flashlights and phones. Additionally, it is equipped with an ePort for all your charging needs. Lastly, it is quite easy to set up, comes with two hanging pockets, ground stakes and storage duffel. 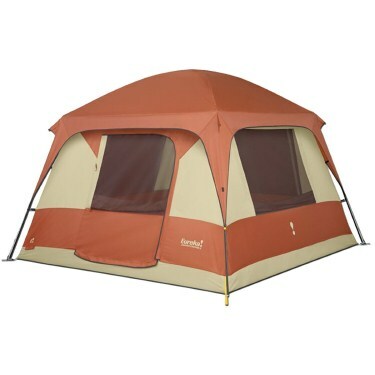 At the end of the day, this is an ideal tent for most family adventures and kickback group outings with the old college gang. 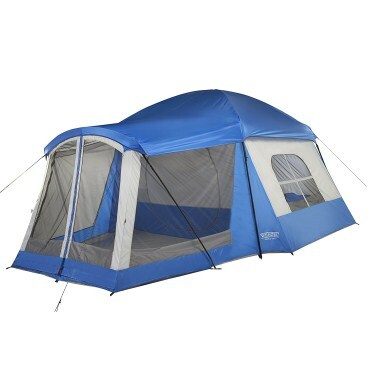 The Coleman 4-Person Evanston is a breezy screened-in tent that is tough on bugs and high on comfort. It’s constructed for simple setup and easy carrying, which is perfect for car campers that don’t want a fussy backpacking tent. This tent also has a screened porch where you can sleep on summer nights, along with a specially-angled rainfly that lets the light in but not the water. The interior is 14 ft. x 10 ft. (4.27 m x 3 m) meaning the floor is large enough to fit two queen size airbeds. The Insta-Clip attachments stand up to high wind and the WeatherTec Systems welded floors and inverted seams help ensure you can listen to rain falling on your tent without fretting that it’ll flood. Additionally, snag-free, continuous pole sleeves mean you don't have to feed the poles through those thin fabric loops that never work and the tent is up and ready in just 15 minutes. 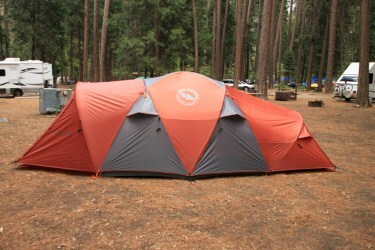 Lastly, it has a mesh roof for stargazing and a rainfly for extra protection. The Toogh Waterproof 3 Season Tent is a 2-3 person backpacking tent with all the comfort and ease of a typical car camping tent. First of all you set up and take it down in 5 min (but proponents of this tent say 60 seconds). It is also extremely lightweight at 7.72 pounds. 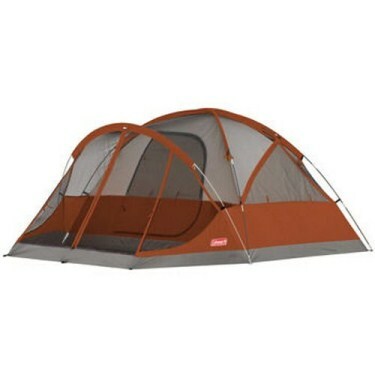 Also, it is super easy to enter and escape the tent with its two-way zippered mesh large openings. Its large mesh side wall vents at the top provide excellent ventilation and stargazing, while keeping mosquitoes and bugs at bay. Finally, it comes with a carrying bag for unfussy transport so you can keep things tidy and organized while swapping campsites or packing up to go home. The Big Agnes Flying Diamond 6 Person Tent is a four-season, freestanding, deluxe car camping camp two-room condo sized tent with plenty of space to stretch out, relax, and entertain friends and family alike. The DAC combination lightweight aluminum poles with press fit connectors, make these poles hardy and as tough as your adventure. Then the color coded pole ends, webbing and buckles make traditional tent pole setup as easy as possible without forgoing the sturdiness that comes with taut poles. Its durable polyester fly and floor are made with 1500mm waterproof polyurethane coating so water doesn’t collect in the bottom of your mesh shelter. All seams are taped with waterproof, solvent-free polyurethane (No PVC or VOC's) material. The sleeves and plastic clips attach the tent body to the pole frame for quick and easy setup. Also, the tent may be separated into one large room and one smaller room, along with a stowable partition wall, allowing you to store your muddy cooler right outside your sleeping chamber so you can snag a beer real quick while playing cards late into the night. The reflective guylines provide optimal nighttime visibility, so you don’t end up tripping over lines that blend straight into the night. It is also equipped with 16 interior mesh pockets & 20 lightweight aluminum hook stakes that’ll last you forever and won’t bend the first time you hammer them into the ground. Lastly, both access doors have vertical zippers with storm flaps which may be staked out and turned into shady awnings. 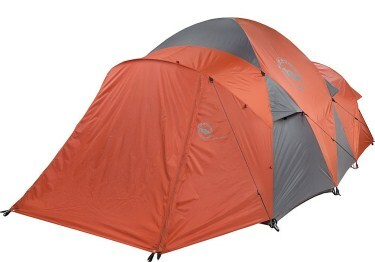 The Big Agnes Flying Diamond 6 Person Tent easily beat out the competition. First and foremost because it is equipped for all seasons and any kind of weather mother nature can throw at you, which is kinda rare in the car camping tent world, which populate the category with more flimsy tents. The second reason why it dominated is due to its outstanding quality features— reflective guylines so you don’t trip over your own tent when you return from a midnight bathroom break, a mesh vestibule so you can keep messy gear close but you don’t have to cuddle your dirty old ice chest, and watertight seams so no unexpected liquids leak into your precious, warm sleeping bags. At the end of the day, all of these tents will elevate your car camping experience, so if you like the look of that Coleman or want the insane space of the Wenzel, you really can't go wrong with any of them.